The June 19, 2018 hailstorm that damaged many homes, vehicles, trees, gardens and field crops was a reminder that hail, unfortunately, is a predictable part of Greeley’s and northeastern Colorado’s history. Greeley’s first hailstorm was in July 1871, but was eclipsed by a second hailstorm that struck Greeley on Wednesday, June 20, 1877. The damage inflicted upon crops and downtown businesses was recounted in an article published in the Colorado Sun on June 23, 1877. The hailstorm approached Greeley from the north. It was described as “lively” with hailstones 1 ¾” in diameter, balls of ice weighing two to three ounces each and as “hard as boulders.” Wheat farmers suffered major crop losses, and Greeley’s strawberry beds were shredded. Corn and oats were destroyed, and there were total crop losses in the Evans area, and hail formed large drifts at Pierce Station. Several people were struck by projectile hail and the article noted that newly shorn sheep and lambs would have suffered during this storm. 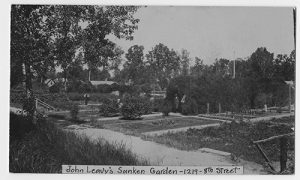 As a result of the 1877 storm, John Leavy, Greeley’s florist, had 985 panes of glass broken in his greenhouse, R.B. Harrington lost 40 panes in his “hot houses,” and 65 panes were broken in the skylight of B.F. Marsh’s photography gallery. The hail broke 12 large windows in Theodore Ingalsbe’s residence, 70-80 windows in the Meeker School, and the Baptist Church lost 14 windows and the Methodist Church lost 35. Windows were broken in Dr. Jesse Hawes’ office, as were large panes in the “bank parlors” of Emerson & West. The firm of Chamberlain and Fedderson requested that residents who had broken glass large enough to be re-cut into 4” x 7” panes contact them as this would help Mr. Leavy replace some of the many panes in his greenhouse. The Greeley Tribune in its May 22, 1902 edition reported on a great storm that moved from Owl Creek to Grover, Colorado depositing four to eight inches of hail across the plains. The hail was followed by a “cloudburst that deluged the county for miles.” Dry creek beds swelled with roaring torrents of water and 150 lambs owned by Walter Farr drowned in a draw that almost instantly filled with water. The rest of his 700 sheep were dispersed over the plains by the storm, but on a positive note, the rain filled creeks, draws, livestock watering holes and provided welcomed moisture for the native pasture grasses. Greeley residents are a plucky lot, and on Wednesday morning, many residents were up early clearing their yards and gardens of debris after the hail and deluge of June 19, 2018. 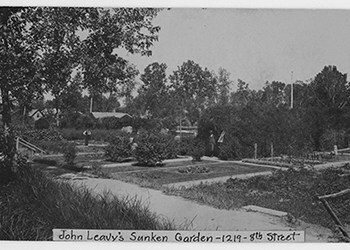 John Leavy’s sunken garden, 1219 8th St.